Un extraíble partial denture is designed specifically to meet the needs of the patient and can replace one or more missing teeth. A natural appearance and speech clarity is restored along with the ability to eat more efficiently. 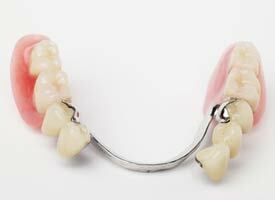 Un extraíble partial denture may help limit movement of your existing natural teeth. They also allow you to better grind and chew food improving digestion.